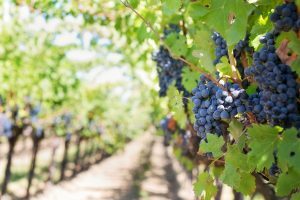 Wine grape growers and researchers in north Georgia gathered on Nov. 1 to discuss the 2017 season and harvest. Kaya Vineyard and Winery, in Dahlonega, Georgia, was the host of the roundtable discussion. The conversation included growers, researchers and other industry professionals talking about the harvest season and results. Clark MacAllister, University of Georgia’s Extension coordinator for Dawson County and the Lumpkin County agriculture and natural resources agent, attended the roundtable discussion. He said the discussion was held closer to harvest than normal, so growers could remember and share all the vital details of the season. This meeting is not typically held until the spring, since growers go right from harvest into wine production. Having it earlier gave the growers a “chance to talk with fresh minds,” MacAllister said. During the discussion, many growers spoke about disease issues. Downy and powdery mildew were two main issues. MacAllister said many growers have a good management system for downy mildew. There is a problem, however, if this disease is not found until mid-season because the spray has a large pre-harvest interval. Since there was some heavy rainfall this year, powdery mildew was an issue despite growers applying the normal spray regimen. Plans call for a spray technician to visit the vineyards to give advice for the years ahead, MacAllister said. Getting growers together directly after the harvest also gave them a chance to give and receive advice on what varieties worked best in different areas of the state. Some varieties being tested are hybrids, which MacAllister said have been tested in places such as Texas and Florida. There is a concern for the success of some of the hybrid varieties in Georgia, because of the frost early in the year. Ariel Padawer, a wine grape grower from Kaya Vineyard and Winery, also mentioned the importance of carefully choosing varieties because of the Georgia climate. He stressed the importance of region-specific research as well. “Research that’s done in … Europe or in even other states doesn’t translate 100 percent,” he said. MacAllister and Padawer both said the roundtable discussion helped push the wine grape industry forward.